You know you’re in post-modernist territory when the raw and naked energies of the old Southern juke joint tradition becomes the subject of an art installation, and the African American experience of the 1950s and 60s was the juke joint, who woulda imagined this!! The classic juke joint was an unlicensed liquor dispensary, a place for people to get together, relax, dance and drink. Free of the pressures of home or work, the juke joint was in many ways the only place where people could be themselves. 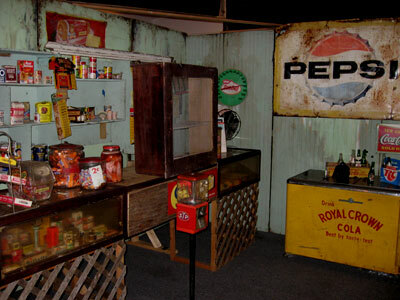 Artist Willie Little developed the Juke Joint art installation to memorialize that experience. Little, who grew up in the tiny rural town of Little Washington NC, works from a ‘tribal’ connection with this world. His father ran a small grocery in Little Washington, and after hours, Little’s Grocery was transformed into a juke joint. Little’s expansive installation is closely modeled on that store and its nighttime regulars. All of the Juke Joint characters are based on real people. “I was the youngest in the family, but I felt like I was privy to grown folks’ conversations,” Little says. “I was like a sponge, absorbing everything that was around me. And I told myself one day, ‘I’m going to remember this for the rest of my life.’ Every Thanksgiving, my sisters and I would sit at the dinner table and start talking about these characters. We would always start with Eshu and Glory.” Juke Joint depicts that couple “out back” engaging in stand-up conjugal activity.